Dukes Meadows offers a state of the art video analysis bay. The use of video enables analysis of movement in slow motion to detect any swing faults for faster diagnosis and correction. The V1 system offering video analysis for the golfer, with 2 cameras for face on, and down the line viewing, giving instant visual feedback for the pupil. Cost: £5 when booked with a golf lesson. This service offers the customer a wide range of leading manufacturers golf equipment to be tried & tested in our designated custom fitting studio. Our expert fitters will help find the right clubs for you, fitted to the correct specification for your individual game, backed up with Flightscope radar and computer club fitting technology. Cost: The club fitting bay cost £40 per session however fitting costs are fully refunded against any equipment purchased from our Pro Shop. Please call us 020 8994 3314 for more information. 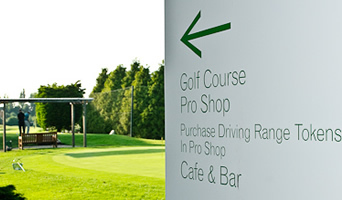 Our Pro Shop has all the latest golf (and tennis) equipment in stock as well as equipment available for hire.